It would be wonderful if they asked me when I didn’t have ten thousand things to do. What a dream world, where every time your children want your attention you can simply set down what you are doing and play with them. Keeping a list of “I’m Bored” activities is a great way to occupy your children when you can’t stop and play with them at the moment. These activities should keep them busy long enough for you to finish dinner or washing the dishes. To start gathering ideas, brainstorm using different objects in your home. What afghan would work best as a cape? What cooking pot would make the best base drum? Or, think about objects that are pretty easy to obtain. Cardboard boxes could be a castle or a fort. Keep a couple of boxes in the back of a closet. This is a very easy game that you can do while you are doing other things. Get a few things that are all the same: like pieces of green construction paper or black socks. Have your children sit on the couch and cover their eyes while you hide ten or fifteen around the house. Then, they are in charge of finding them. Make it a competition or see if they can find them all in a set amount of time. 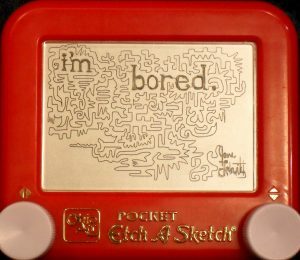 How do you avoid the dreaded “I’m bored” from your kids?